This commission was done for manukoa . 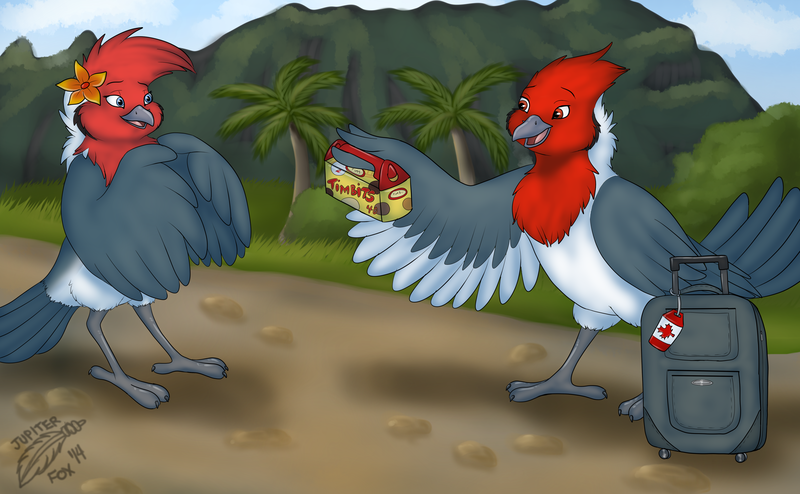 He was kind enough to let me draw his beautiful red-crested cardinals because I really wanted to do a disney-esque commission..something more cartoony and non-anthro. This is the result! Manu Koa has just arrived home in Hawaii after visiting Canada, and shows Kalena Pau the Timbits from Tim Hortons he has brought back for her. Kalena Pau feels nothing but warmth and joy because Manu Koa went out of his way to bring her back this special treat.